Уменьшенная копия Живой песок. Выпадает с некоторым шансом с Совета старейшин (3й босс Престола Гроз) и по непроверенным данным с треша перед ними. упал с треша перед Советом старейшин в Престоле гроз в первый же кд. Так же падает в лфр счастливчикам с того же треша. Seems like elemental , but abilities a bit specific . Early guess as to the drop location of this could be the Council of Elders boss fight in ToT, seeing as adds with this model are part of the fight. Sand Coffin would really fit this pet as an ability. Just want to confirm the drop off Council of Elders. 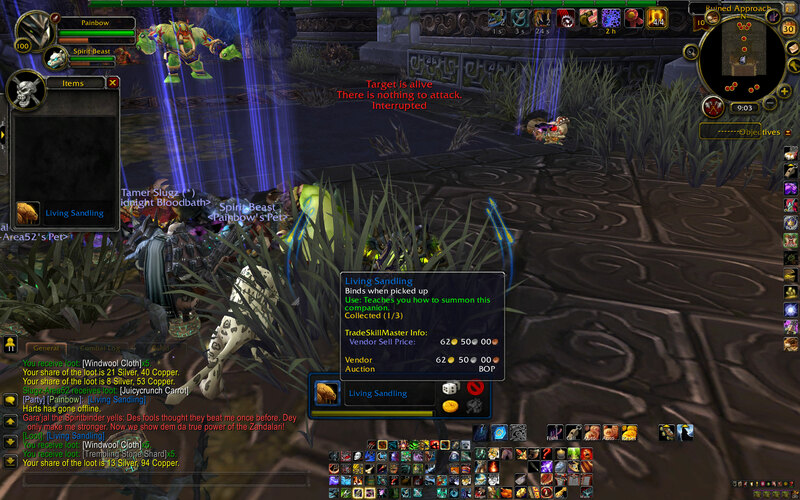 Got one during the LFR testing. Received one on live from the trash preceding Council of Elders. The level 1 H/H breed has only 171 health and not 172 as written here on wowhead. I actually think one of the slower breeds (H/H or H/P like mine) might be better: With Quicksand and Sand Bolt up, the enemy will probably be slowed so much that even the lowest speed Sandling will go first. I favor using the following moves: Sand Bolt, Stoneskin, Quicksand. Compared to Punch, Sand Bolt is strictly superior: it does the same exact damage and applies its 1-turn slow effect. I was initially in support of the damage-dealing Sandstorm over Stoneskin, but then I remembered that as an elemental the Sandling does not benefit from the effects of a sandstorm. For the last move, Stone Rush does more damage more frequently, but the backlash is generally not worth it compared to Quicksand. I suppose a H/H sandling could use it to good effect, but I still feel like not making things easier on your opponent is a good thing. EDIT: With SoO changes, the Sandling now benefits from Sandstorm's damage reduction, making Sandstorm not only a viable choice, but probably the better choice. Once that's in place, Quicksand versus Stone Rush is a personal matter. Since patch 6.1 I have not seen one of these drop. Between my friend and I, about 20 runs and not a single pet from the Sand Elementals. Edit: Why are you voting this down? Do you have proof they still drop from the Sand Elementals in Throne of Thunder? I haven't gotten one since patch 6.1 and in fact I'm trying as I type this. I used to be able to get one within about 20 minutes of farming on a consistent basis. Haven't seen a single one drop since. If you have seen one drop, post a screenshot and let us know how long you farmed until you got it. Thanks. That pet works great v. undead AoE combos in PvP pet battles. It's like an elemental version of Anubisath idol (if H/H) if Idol would take rupture. So Sandling has stone rush and sandstorm, But it's better due to Sand bolt. So it doesn't take more damage from undead attacks but also covers backline pets with Sandstorm. In your face, Graves! Эти опасные песчаные создания могут рассыпаться и вновь собираться в мгновение ока.